More than 7000 sqm of fun for all family. With Mini Golf, Swimming Pool and Basketball Court. Ideal for unique family moments. Imagine the wonder of your child exploring a playground filled with two life-size wooden pirate ships - complete with an endless view of the Atlantic Ocean from their perch high atop the cliffs of the Algarve. The program and outdoor facilities is offered to all guests, with some activities within the program, incurring a nominal charge. It is recommended that you pre-book your child's participation by contacting us by e mail or phone +351 289 500 100 (Ext. 3636). Daily activities are organised by age and include finger painting, arts and crafts, treasure hunts, water games, face painting and various sporting activities. Pre-reservation and information request here or by phone +351 289 500 100 (ext. 3636). 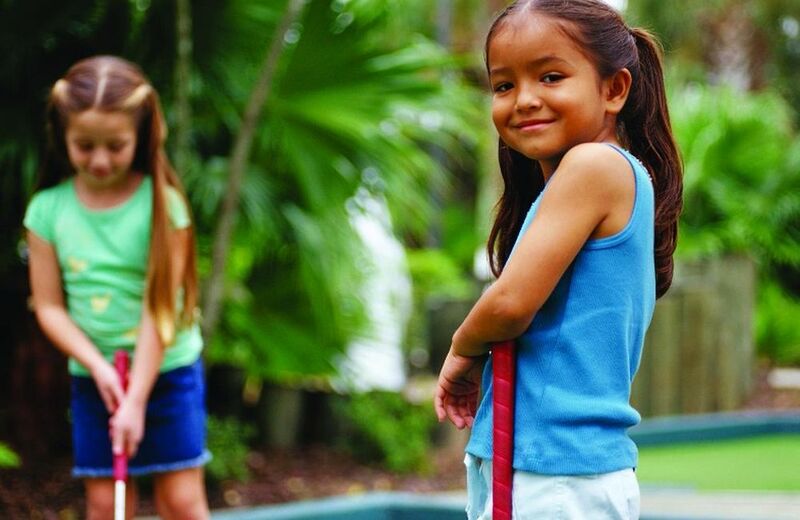 18-hole mini-golf course to entertain the whole family. Pre-reservation and information request here or by phone +351 289 500 100 (ext. 3636). The schedule of Porto Pirata is seasonal. Carnival, Easter, May, September, October, Halloween and New Year's Eve.